The weather has changed - as it had to. Yesterday evening I was walking along in the dark wearing nothing more than a light long-sleeved wool t-shirt (yes, yes...and trousers, boots, socks etc for the pedants amongst you). I stopped to have a chat with a builder - affronted I thought he was a farmer - and he mentioned it was going to rain today. Well, at times it's almost like I know what I'm doing - though I thought that the other morning and then kicked over my mug of coffee made with the last of my water. 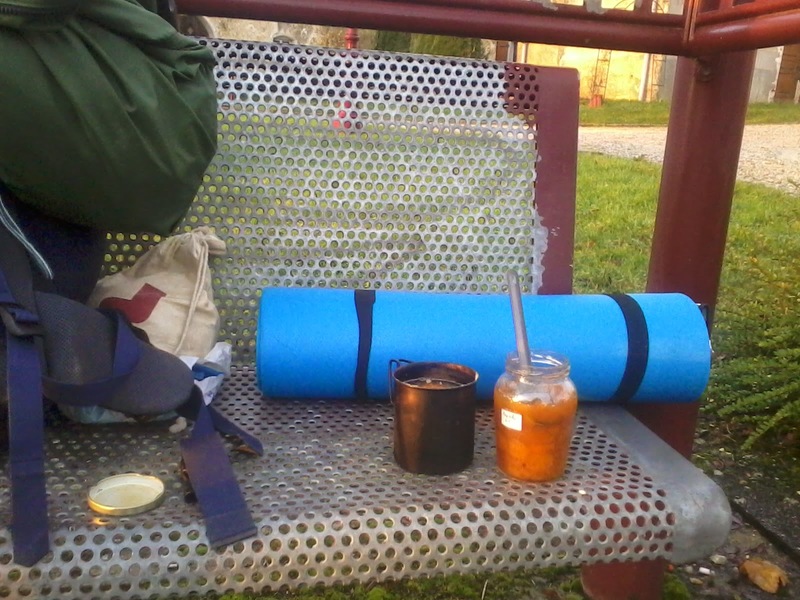 But anyway, I nipped across a field a few kms on, bustled around with tarp and bungees and pegs and was soon in my bag, under shelter and brewing up soup and eating good cheese. It rained in the night, and here's the professional bit - and then stopped just before dawn. Tempting as it was to lie abed warm and dry, I kicked myself out and broke camp in the brief period of dry bertie it rained again. Putting up and taking down shelter is my most vulnerable time as my tarp is also my via poncho and can't be both at the same time. And the rewards of a long day yesterday and an early start? I'm sitting in a café in Mirecourt, with a bucket of coffee, reasonably dry and watching flotillas of umbrellas floating past the window. I've just bought two large scale maps that will take me almost to Paris. An expense and extra weight/bulk (though I'll be cutting them down to the relevant narrow strips) but being able to take tiny roads and tracks and avoid roads with traffic has been key to enjoyment - I've been forced to verge crawl many unavoidable miles into the face of speeding traffic and it's hell. Yesterday's low was cutting across country on a web of small roads and at one point passing a car in the gate of a field as I trotted south, and half an hour later seeing the same car in the same gateway but now from across the field as trotted north on another lane. The high came soon after when an ambiguous line on the map reached by some canny navigation turned out - as I hoped - to be a dead straight five km track through tranquil beech forest, moving me well forward on the day's 35 kms mileage. (I'm promiscuous when it comes to metric and imperial - do your own 8:5 calculations). It's like playing snakes and ladders, out here in rural France. Choosing smaller roads has carried me far away from Herzog's route since entering France. But we meet again, if only briefly, here in Mirecourt. He spent the night in a show caravan - as in a demonstration model for a sales agency - on the edge of town. The next morning as he was walking in the rain a driver stopped and offered him a lift. He took it and sped forward 25 miles, as far as my longest day walking so far. I've lost him again. But I'll be trotting in his wake, closer to or actually on his original route. Today's picture illustrates the French capacity for responding to disaster. 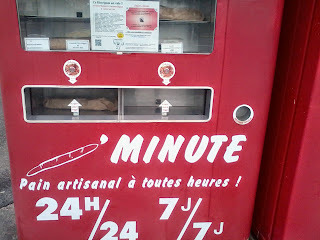 In one village I passed the Boulangerie had burnt down. 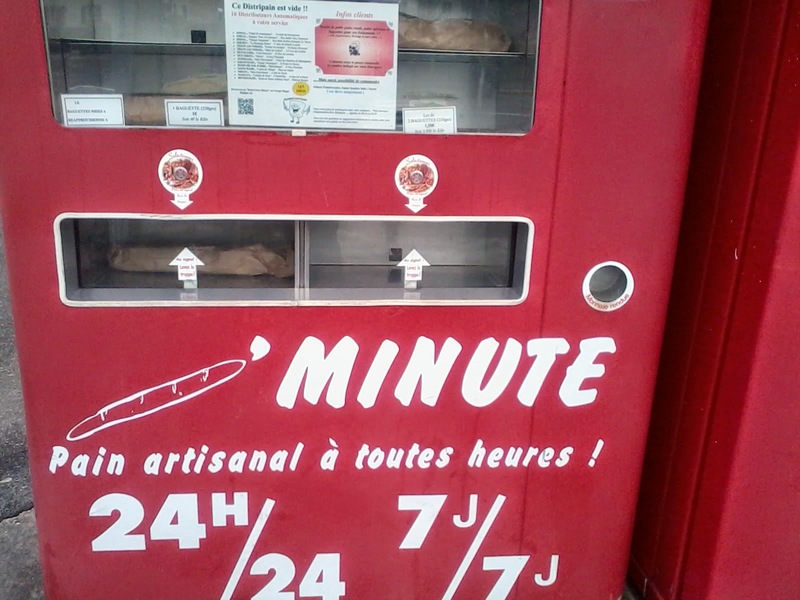 A rapid response force had got a baguette vending machine into place - in a field - before the populace expired. The elderly woman buying her daily bread before me thought it a wonderful sign of modernity, and was thrilled with this convenience. (Perhaps she'd particularly disliked the village baker? Perhaps she was a secret arsonist?). In another irony, the same village had a monument to the fallen of WWI, that was pocked and chipped by the bullets of WWII. 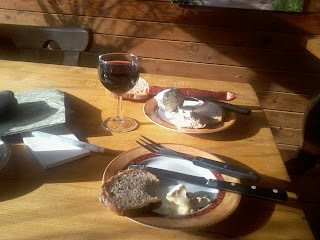 Rain or no rain - and currently it's rain - sitting around in cafes won't bring Paris any nearer. Always hard to avoid looking just a bit wooden in selfies. I've just crossed the Moselle at Thaon, so am across and out of the mountains that rise high on both sides of the Rhine valley, and with neither the snow nor storms that Herzog battled. The land being flatter brings it's own challenges. Long slogs, little shelter, busy agriculture and so less hidden woods or derelict barns to sleep in, and speeding traffic on narrow twisting roads. 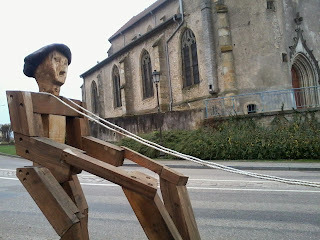 And rural France is a struggle for many locals too - unemployment; so gambling, drinking, suicide. Symptomatic is the small number of village bars and cafes still open. I found just three still trading in over a hundred kms of walking and passing through tens of small villages. Now, in Thaon, I've found a joy. Bar Le Cosy. Good coffee. Wifi - hence another post. An armchair and friendly hostess and clients. It's rather smart and chic and I may look a tad out of place - that facial hair? Vilely unshaven or Serge Gainsbourg chic? - but the French egalitarianism (as well as liberty and fraternity) manifests itself in a polite respect for all; a lovely country to be a hobo in. And also how civilised to be in a society where - as one might - ordering a glass of wine or a cognac before ten in the morning is seen not as moral turpitude but merely what a working man needs before hefting a chainsaw, driving a tractor or gunning down wild boar for the rest of the day. A hand steadier, as it where.